Why is RV GPS better than Smartphone navigation? Have you ever wondered why most RV drivers require RV specialized GPS units for assistance? Well, according to most GPS manufacturers, RV GPS units are gaining popularity really fast due to an advanced set of features for RV drivers. An RV GPS unit is a very imperative component that eliminates guesswork out of your driving demands. For just a moment, imagine how it would be like if your RV was relying on a Smartphone GPS or a traditional automotive unit? I guess traveling would be really stressful right? You see, unlike standard vehicles, RVs are longer, bigger and heavier. Since standard GPS systems are designed for standard automotive, it’s quite difficult for them to adhere to the required set of rules and laws that pertain to RVs. There are many things that come into consideration when shopping for an RV GPS system. Not only does it let you reach your intended destination, this system considers your specific RV characteristics to offer a set of route guidance and alternatives that will make your drive much more simplified. RVs are long, heavy and quite elevated. Due to these reasons, you need to stay on the best roads that will help you avoid heavy traffic, low bridges, weight limits and lots of pedestrians and cyclists. Besides that, RV GPS systems display the best RV amenities such as fueling stations, recreation centers, health centers, restaurants and public garages in case you need to use them. If you’re an RV driver held in a tight schedule, an RV GPS unit will definitely be your best pal. Not only does it offer turn-by-turn directions, this system speaks out the directions for you to follow letting you concentrate more on the wheel than having to check the screen more often for track updates. Finally, most GPS manufacturers understand how boring it is when driving for long distances. To eliminate boredom, some RV GPS brands come with FM receivers to offer live traffic information, internet browsing features, live weather and traffic reports as well as Bluetooth support for hands-free phone calls. Smartphone navigation or RV GPS? This is by far one of the burning questions asked by the vast majority of spontaneous travelers. Although special navigation apps have been introduced to close the gap, RV GPS has excelled in the navigation arena as compared to Smartphones due to a number of key reasons. Here are some of these key pointers that will prove why RV GPS is better than Smartphone navigation. One major setback with Smartphone navigation is the loss of cellular signal. Whether you’re driving in the wild or in a large city through a forest of skyscrapers, losing cellular signal is one setback you must deal with more often than you think. An RV GPS uses 3 of the 24 GPS satellites orbiting the earth to get accurate, fast and uninterrupted signals regardless of where you are. Sometimes, using your Smartphone’s data can be costly than you think. To keep off from the ritual of downloading multiple navigation apps and using them simultaneously just to get accurate updates, having an RV GPS at the disposal might be a cheap alternative. Battery usage is one critical factor you need to check on when traveling. When using your Smartphone navigation system, your battery is likely to drain much faster as real-time navigation apps require data to function thus consuming much of your battery’s life. If you’re using an RV GPS, all you have to do is simply plug the unit in your car’s cigarette lighter and everything will be good to go. Just like we mentioned previously, RV GPS units use three out of the 24 available satellites that orbit the earth to send signals. This makes GPS systems to be incredibly precise and accurate (to within 15 ft) as compared to most third-party navigation apps used in most Smartphones. Let’s be honest here; over 80% of road accidents globally are caused by reckless driving such as driving under the influence of drugs, alcohol and interruption when making or receiving phone calls. Smartphone navigation is no different with making calls as you’ll definitely get interrupted when checking for directions, traffic updates, weather updates and overall route updates. On the other hand, if you’re using an RV GPS, this problem will totally be dealt with as they come with suction-cup mounting brackets that support the device in a precise location within your reach. Now, with an ever-rising demand for RV GPS units, most manufacturers have joined the race to produce fantastic products with an intention of meeting customers’ demands. Due to this reason, it has become quite overwhelming to make an informed decision especially if you’re not fully acquitted with GPS technology. Therefore, if you’re a potential buyer searching for additional information, below are five key pointers that can have a significant impact on your purchasing decision. The first aspect you should lay much focus on when shopping for an RV GPS is the overall screen size. You see, comfort is key when you’re on the wheel. Therefore, to enjoy a hassle-free driving experience, you need to shop for a GPS unit with a large screen (from 5” to 7”) to make it easier for you to check for route updates. Bluetooth capability is one smart feature that simplifies your driving demands. With such an impressive feature, you can easily make hands-free phone calls, search for contacts easily and also make inquiries and reservations all while on the go. Your GPS system’s memory is another factor that must be put into consideration. To improve its functionality, your GPS unit should have a huge memory to make it easier for you to download additional maps and other smart features. In addition to that, your GPS system should allow expandable memory such as micro or SD card slots for the purpose of adding an additional point of interest that might be beneficial to you. To make navigation and traveling much easier, you’ll definitely need to search for an RV GPS that’s compatible with the text-to-speech function. This special feature works by providing audio notifications of particular routes and streets. It also informs you when to turn left or right as well as provide vital updates of specific routes you’re driving on. This feature is so remarkable that it makes you feel like you’re riding with a close pal who knows everything about the roads you’re driving on. Another critical area that requires much attention is the installation tools. To enjoy a stress-free driving experience, you need to search for a GPS system that attaches firmly to your windscreen using a steady suction cup. Make sure the mounting equipment is easy to attach and detach, easy to place or remove the GPS unit and that it’s placed at the right angle for easy viewing of the screen. Now that we’ve covered everything you need to know about when searching for a responsive GPS unit, this guide will now go straight to review 5 of the best GPS systems for RV drivers. For truck drivers we also covered best gps navigation systems in this article. Are you an RV driver searching for an advanced navigator that will upgrade your roving lifestyle? Well, the best navigation system you need to invest in is none other but the Garmin RV 770 GPS Navigator. A prominent GPS system that’s packed with multiple features, the Garmin is surely an advanced navigation system that features a vast range of profile information enough to meet all your traveling demands. The Garmin comes with a large 6.95” touchscreen, a wide directory that gives you a comprehensive listing of all the available amenities within your route, Bluetooth/WIFI connectivity for hands-free phone calls and voice-activated navigation that lets you give voice commands to the navigation system. Inbuilt directory: to enjoy your RV lifestyle to the maximum, you can take advantage of the comprehensive listing of your Garmin GPS to find your preferred amenities such as campgrounds, truck shops, repair shops and on-site laundry. Live services: here, you can link your Garmin GPS with your Smartphone via a Smartphone Link app to enjoy live services such as route updates, weather forecast, traffic jams, alternative routes and RV-related restrictions such as weight limits and low bridges. Inbuilt WIFI/Bluetooth connectivity: with the aid of Bluetooth and WIFI connectivity, traveling will now be more fun-filled as you’ll have the freedom of making hands-free phone calls while receiving live updates of the routes you’re driving on. The Garmin has a large 6.98” touchscreen that makes viewing of updates much easier. The built-in WIFI allows a stress-free software update without the need of a computer. Bluetooth connectivity allows you to make hands-free phone calls with just a touch of a button. The Garmin offers you a comprehensive listing of major routes and all their amenities. This navigation system gives you live services such as route updates and weather forecast that are relevant to your specific RV. According to most customers, the Garmin is quite inaccurate as it misses some major maps and vital amenities such as gas stations. Some customers are quite annoyed by the multiple notifications even those of small curves. In case the Garmin is not exactly what you’re searching for, why don’t you try the Magellan RoadMate RV9145-LM GPS Navigator then? You see, unlike our former RV GPS, the Magellan comes with a larger 7” touchscreen display that’s both large and bright enough to give you an instant access to whatever you wish to search for. To make driving a breeze, the Magellan RoadMate RV9145-LM GPS Navigator is engineered with impressive navigation software that features multiple preloaded maps of both the United States and Canada. This GPS system allows free map updates, a one-touch favorites menu, a quick spell function and an intelligent Good Sam Trailer Life Directory that lets you access all your preferred RV amenities such as RV parking, gas stations, restaurants and hotels. Excellent user interface: if you value comfort a lot, then the Magellan is definitely the perfect option for you. 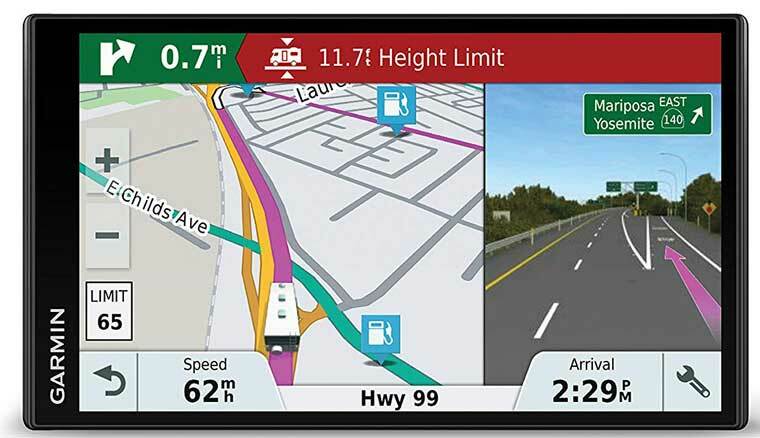 Designed with a massive 7” touchscreen, this GPS unit will display your preferred maps either in 3D or in bird’s eye view to make sure you see all your RV’s points of interest. Multiple preloaded maps: to ensure that you’re fully familiar with the routes you’re driving on, Magellan RoadMate GPS Navigator offers you multiple maps from all 50 U.S. states alongside Canada and Puerto Rico. Route customization: with the ability to master your RV’s profile, this GPS system is able to integrate with your RV’s settings to give you helpful notifications on the routes you’re driving on depending on your RV’s height, weight, length and any other driving preference. This GPS system has a massive 7-inch touchscreen that offers a perfect display of routes and maps. The QuickSpell function is handy as it prevents any typing errors when entering data. There are 6 million points of interest for RV drivers to take advantage of when traveling. The text-to-speech function eliminates any guesswork when driving as it gives you clear audible instructions about where to make the next turn. According to most disappointed customers, this GPS unit doesn’t offer lifetime map upgrades. Uploading new maps and software using a computer is quite difficult. According to some customers, the technical support team is not responsive. Following some major concerns with the Magellan RoadMate RV9145-LM GPS Navigator, some customers have opted to search for alternative GPS systems. One such navigation system is the Garmin RV 660LMT 6-Inch Navigator. Whether you’re an enthusiast truck driver or an avid camping and hiking aficionado riding on an RV, the Garmin RV 660LMT is definitely what you need to keep fully updated about the routes you’re driving on. Similar to most top rated RV GPS units, the Garmin RV 660LMT features a massive 6-inch touchscreen that displays major routes and up to date maps, POIs and major RV amenities for you to take full advantage of. To enjoy the best out of your driving ritual, simply enter your RV’s profile in Garmin’s system and the GPS will do the rest. There are nearly 20,000 sites to view both in U.S. and Canada, over 14,000 RV amenities to enjoy, easy route shaping and live updates of the routes you’re driving on. Filterable directory: depending on your specific RV requirements, the Garmin RV 660LMT has the capacity to filter your directory to give you access to specific parks and services such as campgrounds, repair locations and pet-friendly parks. Easy route shaping: with such an excellent feature, you don’t have to worry much when driving on unfamiliar routes as you only need to point those routes to receive specific notification about them. Voice command navigation: finally, to make traveling even more fun-filled, the Garmin RV 660LMT lets you take advantage of the voice-activated navigation to send voice commands to the GPS instead of having to input text-commands. The Garmin RV 660LMT offers you a wide array of maps and RV amenities for you to choose from. This super large touchscreen is designed to display crystal clear maps and routes with concise graphics. The voice-activated navigation function ensures that you enter and receive route information without getting distracted while driving. By just entering your RV’s profile, this GPS system will perform its calculations and ensure that you stick on the right roads free from traffic and low bridges. According to most customers, the Garmin RV 660LMT has a tendency of making serious navigational mistakes where it directs you to strange or dangerous routes. This GPS unit doesn’t come with a user manual making operation quite complicated. The battery system is very weak and doesn’t last for long. Our list can never be complete without naming the Rand McNally TND 520 Truck GPS. Whether its route updates, searching for basic amenities, accessing fuel prices or checking for the weather forecast, the Intelliroute TND 520 is an intelligent GPS system that lets you enjoy the best out of your driving rituals. Having interviewed multiple veteran truckers, Rand McNally has managed to add essential features in their device that are beneficial to the vast majority of the driver community. 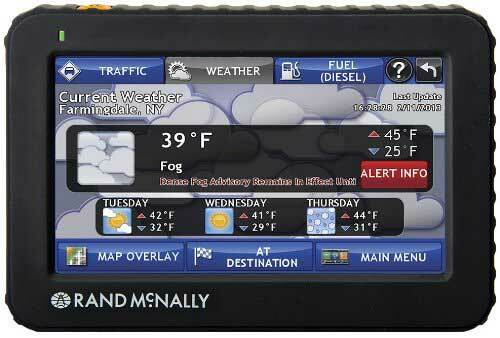 Apart from a massive 5-inch display, this GPS system offers you roadwork construction updates, traffic updates, weather updates, mileage information and multiple RV and truck amenities that are specifically targeted to your truck or RV. WIFI connectivity: with a ready WIFI connection, there’s a lot to enjoy out of your daily trips such as accessing weather updates, fuel prices, traffic updates and local businesses along the routes you’re driving on. Route information: apart from accessing route updates, the Intelliroute TND 520 allows you to choose alternate routes between towns and cities, search for stops and POIs just to ensure that you save time and fuel. First, this GPS system is very comprehensive making it a perfect choice for both beginner and professional truckers. The Intelliroute TND 520 allows you to easily download route updates to keep up-to-date when driving. The WIFI connectivity allows you to receive a wide range of updates from weather updates to your truck’s mileage information. This GPS system allows you to choose alternate routes to save time while still allowing you to calculate mileage between different towns. This GPS system is quite disappointing as it doesn’t have a majority of the routes. Sometimes the touchscreen is unresponsive making it hard to register some letters and numbers. 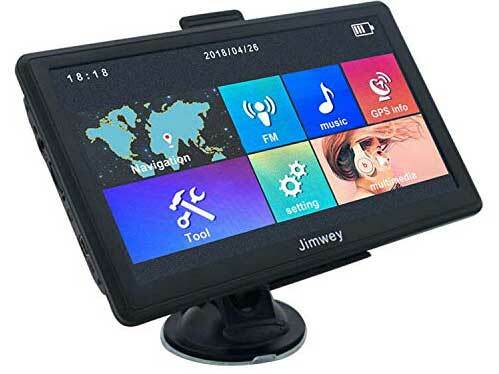 And finally, in our review of the best RV GPS navigation systems, we have the GPS Navigation for Car, Jimwey. In case you feel like the last four GPS units are too expensive for you to afford, then this unit will definitely offer a cheaper alternative that will meet all your driving demands. The reason why we chose this GPS system over its closest rivals is due to its wide range of features. First, this GPS unit features a 7” display that gives you access to multiple maps and routes. It has a capacity of 8GB and a further 256MB RAM to provide ample space for map upgrades. There are live maps and multiple regional map updates that are viewable either in 2D or 3D. In addition to that, this GPS system offers you 7 vehicle modes that range from car, truck, pedestrian, bicycle, emergency, bus and taxi. Designed with a massive 1500 mAh battery, the GPS Navigation for Car, Jimwey is exactly what you need if you’re really looking to advance your driving needs without having to break the bank. Large capacity: one smart feature with this GPS unit is the huge capacity. With a massive 8BG ROM and a further 256MB RAM, this navigation system has enough space to download multiple maps to help you through your driving needs. Multimedia entertainment: to make your RV lifestyle even more fun-filled, the GPS Navigation for Car, Jimwey is fitted with an FM broadcast, an MP3/MP4 video and audio player, games, pocket calculator and over 40 languages for you to take advantage of. 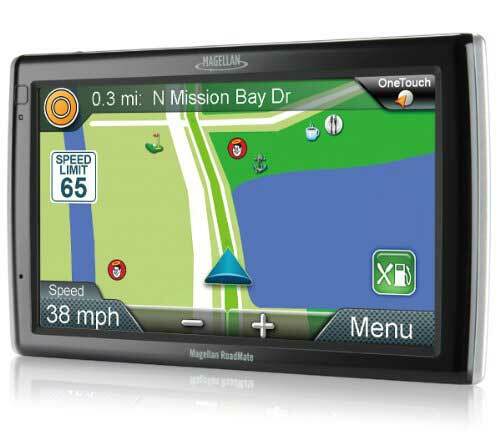 This GPS system has a massive 7” display that offers a perfect view of maps and directions. Also, it has a wide range of vehicle modes which include; taxi, bus, emergency, bus, pedestrian, bicycle and car. Supports FM broadcast, MP3 and MP4 players to keep you both entertained and updated on what’s happening ahead. It has a large 8GB capacity that’s enough for downloading maps and new routes. According to some customers, this GPS unit lacks some crucial components during packaging such as the charger and the windshield mount. The WIFI connectivity sometimes fails to work making it hard to search for POIs, locations and route updates. Finally, as we wind up, let me mention that an RV GPS navigation system is a key component you can’t afford to miss out if you’re a frequent trucker or RVer. Not only does it make your traveling ritual more convenient and flexible, this system ensures that you plan ahead by providing you with a list of POIs that are relevant to your specific truck or RV. It gives you turn-by-turn directions of new routes, provide you with multiple updates such as gas stations, construction sites, weather forecast and weight limits that are specific to your specific RV’s profile. Now, when shopping for an RV GPS, some of the key features you shouldn’t miss out are the profile feature, Bluetooth feature and the text-to-speech function. With that being said, I believe this guide was helpful. In case there’s something we missed out or maybe you’d like to share an experience, please don’t hesitate to get in touch on our comment section below.